(CAMBRIDGE, Mass.) — The first thousand-robot flash mob has assembled at Harvard University. Just as trillions of individual cells can assemble into an intelligent organism, or a thousand starlings can form a great flowing murmuration across the sky, the Kilobots demonstrate how complexity can arise from very simple behaviors performed en masse. To computer scientists, they also represent a significant milestone in the development of collective artificial intelligence (AI). 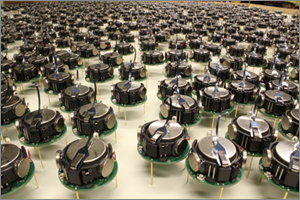 In this video Kilobots self-assemble in a thousand-robot swarm. The algorithm developed by Wyss Institute Core Faculty member Radhika Nagpal that enables the swarm provides a valuable platform for testing future collective Artificial Intelligence (AI) algorithms. 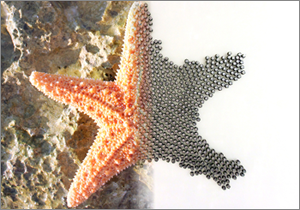 This self-organizing swarm was created in the lab of Radhika Nagpal, a Core Faculty member at the Wyss Institute for Biologically Inspired Engineering at Harvard University where she co-leads the Bioinspired Robotics Platform, and Fred Kavli Professor of Computer Science at the Harvard School of Engineering and Applied Sciences (SEAS). The advance is described in the August 15 issue of Science. “Biological collectives involve enormous numbers of cooperating entities–whether you think of cells or insects or animalsæthat together accomplish a single task that is a magnitude beyond the scale of any individual,” says lead author Michael Rubenstein, a research associate at Harvard SEAS and the Wyss Institute. Most notably, the Kilobots require no micromanagement or intervention once an initial set of instructions has been delivered. Four robots mark the origin of a coordinate system, all the other robots receive a 2D image that they should mimic, and then using very primitive behaviors–following the edge of a group, tracking a distance from the origin, and maintaining a sense of relative location–they take turns moving towards an acceptable position. With coauthor Alejandro Cornejo, a postdoctoral fellow at Harvard SEAS and the Wyss Institute, they demonstrated a mathematical proof that the individual behaviors would lead to the right global result. The Kilobots also correct their own mistakes. If a traffic jam forms or a robot moves off-course-errors that become much more common in a large group–nearby robots sense the problem and cooperate to fix it. Yet, at scale, the smart algorithm overcomes these individual limitations and guarantees–both physically and mathematically–that the robots can complete a human-specified task, in this case assembling into a particular shape. That’s an important demonstration for the future of distributed robotics, says Nagpal. The Wyss Institute for Biologically Inspired Engineering at Harvard University (http://wyss.harvard.edu) uses Nature’s design principles to develop bioinspired materials and devices that will transform medicine and create a more sustainable world. Working as an alliance among all of Harvard’s Schools, and in partnership with Beth Israel Deaconess Medical Center, Brigham and Women’s Hospital, Boston Children’s Hospital, Dana Farber Cancer Institute, Massachusetts General Hospital, the University of Massachusetts Medical School, Spaulding Rehabilitation Hospital, Boston University, Tufts University, and Charité – Universitätsmedizin Berlin and the University of Zurich, the Institute crosses disciplinary and institutional barriers to engage in high-risk research that leads to transformative technological breakthroughs. By emulating Nature’s principles for self-organizing and self-regulating, Wyss researchers are developing innovative new engineering solutions for healthcare, energy, architecture, robotics, and manufacturing. These technologies are translated into commercial products and therapies through collaborations with clinical investigators, corporate alliances, and new start-ups.